This year's Michigan Area GOYA Lenten Retreat was hosted by St. John Church in Sterling Heights, MI. Metropolitan Nicholas was also present at this event along with other local clergy: Fr. Nicholas Kyritses (Proistamenos of St. John), Fr. Dean Hountalas, Fr. Aristotle Damaskos, Fr. Mark Sietsema, Fr. Nicolaos Kotsis, Fr. Angelo Maggos and Fr. Sean Govostes. Eva Kokinos (Metropolis Youth Director) coordinated the retreat along with staff recruited from the local chapters. There were 115 registered participants. 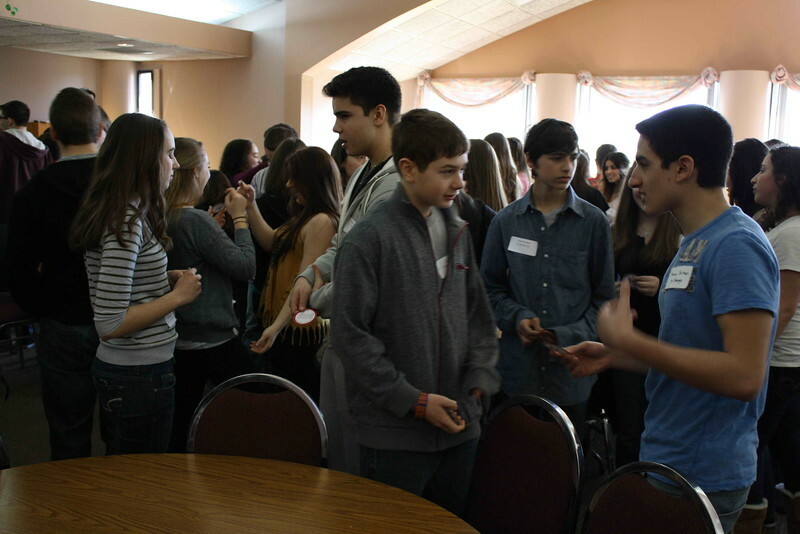 The retreat started with an opening prayer in the church, followed by icebreakers. There were four discussion sessions entertained by Metropolitan Nicholas, Fr. Dean Hountalas (on Confession), Fr. Angelo Maggos (on Peer Pressure) and Fr. Mark Sietsema (on Bullying). Also, the attendees had a chance to work on a service project cutting blankets that will be donated. The dinner was followed by questions & answers with clergy and a closing prayer.